December was always a good month for fund-raising suffrage parties. For the suffrage movement was not all about militancy and processions. Money had to be raised to pay for the campaigning and for the management of the rapidly-developing organisations – and much of it was done in the time-honoured way of bazaars and balls. Here is a flyer for a Café Chantant organised by the London Society for Women’s Suffrage in December 1909. The flyer comes from the collection of Kate Parry Frye, where it lay between the pages of her diary in which she describes the event itself. ‘Agnes [her sister] and Katie [Finch-Smith – neé Gilbey -her cousin] arrived about 12.30. I had lent Katie a white dress as she had not got one and she had brought up the regulation white cap and apron and I also supplied the colours. I wore my best. We started off just before 2.30. One bus to the Grove [that is, Westbourne Grove] and another to Kensington and to the Town Hall for the Café Chantant got up for the Funds of the London Society and National Union. It began at 3 o’clock. Katie left her things in the cloak room and we all went upstairs together. Agnes had to pay her 3/- to go in and for tea but Katie and I went in free. I found Mrs Rowan Hamilton who had charge of the Palmists and she hadn’t got me a table and I would not begin till she had one brought. I had told her two chairs and a table would be required. I had a little spot close by screens – my name up – ‘Katharine Parry’ – spelt wrong of course. I was just beside the tea tables so I could be near Katie till the fun began. We introduced her to lots of people. I hoped she enjoyed it but I think she got very tired. Miss Lockyer [she had been housekeeper to the murdered storekeeper, William Whiteley] with a friend came very early and I am afraid did not enjoy herself much. I just spoke to her but could not leave my corner and she thought 2/6 too much to consult me – it was a lot. There was another Palmist ‘Ravario’ and my crystal gazer – Clare Crystal. Agnes and Katie consulted her and found her rather poor. The Wrights were there, of course. Alexandra only a simple ‘Tea Girl’ but she selected Agnes to have tea with her – such an honour for Agnes. Miss Carl Hentschel was a Tea Girl and her Mother helping everywhere and lots of people I know. At first I could not get any clients – no-one knew me. The first was a man about 3.30 – a funny sort of thing – then a lady, who was so delighted she went out to boom me and she did – for, for the rest of the day, I was besieged. I could have gone on all night. It was hard work but I enjoyed it. I had such nice interesting people – a few made me feel miserable, they were so unhappy – but some were charming – two insisted upon having my address. One said she would try and get me some engagements – a Miss May Oakley. I kept on till 20 minutes to 6 when Agnes dragged me out to have some tea – and John [Collins, her fiancé] came upstairs – he had been taking tickets from 2.30. So I had some tea and he had a second tea. We had it from Miss Doake’s table as Katie was away. I had promised to go back at 6 o’clock and there was already a client sitting in the retreat. I kept on till 6.30 when the affair was over for the afternoon and we all four went home feeling very tired. John had to be back before 8 o’clock and we were not back till after 7 – so had to rush about and he had a meal as quickly as it could be got and go off. Leaving Agnes behind, Katie and I left again at 8 o’clock and went by bus to Kensington. It was all in full swing again. The entertainment going on as before and more theatrical and Ju Jitsu displays and heaps of people. John was taking tickets again as happy as a cricket. I had said I would be back 9 till 10 – but I was pounced upon straight away. I had a horrid few moments when I missed my muff but John found it for me. 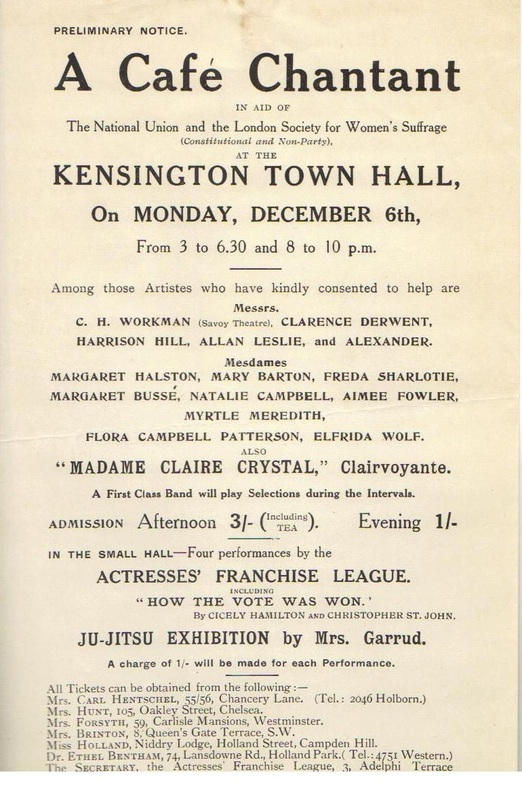 Interesting to see that Edith Garrud was happy to give jujitsu displays for the non-militant society. Kate was very sympathetic towards the Women’s Social and Political Union and was, briefly, a member. 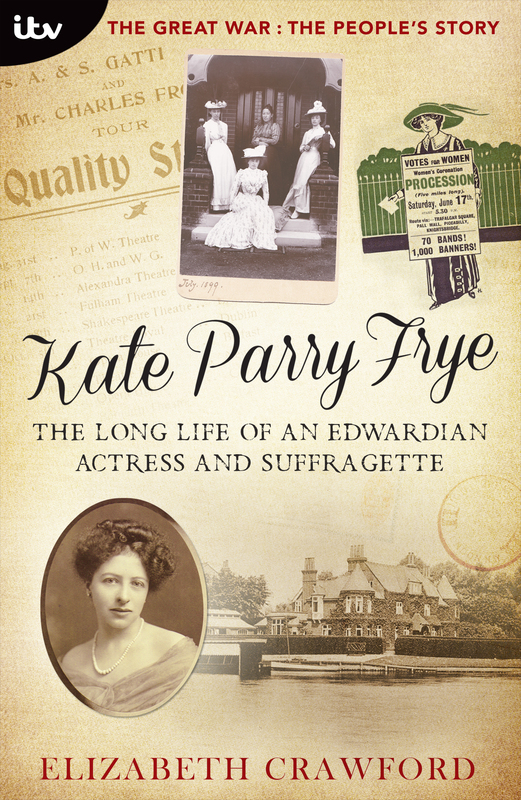 She was particularly concerned about improving the life of her poorer sisters and without a doubt would have loved the film ‘Suffragette’. 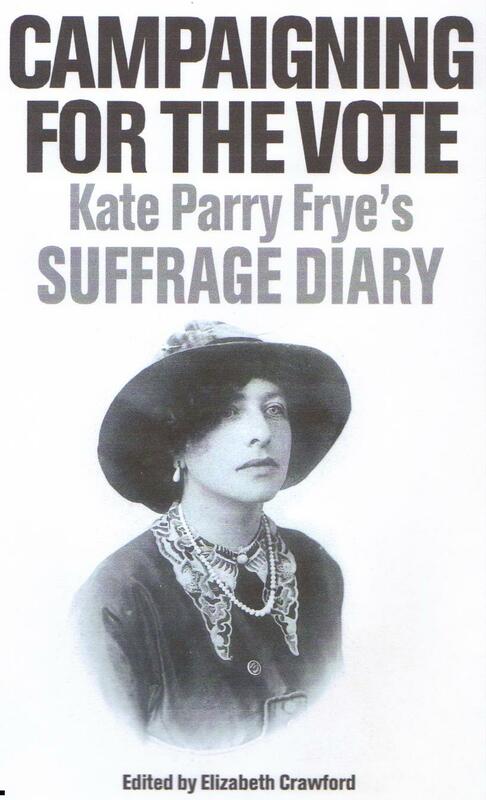 This entry was posted on September 11, 2015, 8:53 am and is filed under Collecting Suffrage, Kate Frye's Diary, Kate Frye's suffrage diary, Suffrage Stories. You can follow any responses to this entry through RSS 2.0. You can leave a response, or trackback from your own site.